The European Union has called upon the government of Zimbabwe to reveal what happened to missing activist Itai Dzamara who was abducted by suspected members of the Military Intelligence Department on the 9th of March 2015 while having a haircut at a local barber shop in Harare. 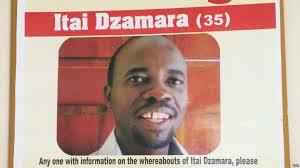 "Four years after his abduction, Itai Dzamara remains missing." The EU said in a statement. "We call on Govt to shed light on his fate and serve justice, and to tackle all human rights violations decisively, in line with Zimbabwe's repeated commitment to human rights, freedoms and national healing." Exiled Professor Jonathan Moyo has always insisted that Dzamara was abducted by the MID under the command of General Mike Sango. "On 14 July 2018, I said that Itai Dzamara was abducted by Military Intelligence Department (MID) under General Mike Sango as CDI under Chiwenga." Prof Moyo said on Twitter recently. "Six months later and scared by my Letters to my father book, Itai Dzamara's abductors have confessed under the guise of accusations via a MID ghost account." The United States of America in 2018 amended the Zimbabwe Democracy and Economic Recovery Act and inserted a clause that for sanctions to be removed the state must also institute investigations into the disappearances of Itai Dzamara, Patrick Nabanyama and Paul Chizuze.